75800140 is rated 4.5 out of 5 by 2. While other products may gather unsightly mineral build-up over time, Delta soft rubber Touch-Clean spray holes allow any mineral residue to simply be wiped away for an instantly refreshed look – with no need for soaking or the aid of chemical cleaners. The pause setting gives you ample space for shaving, lathering and other shower tasks, then easily restarts the water with the temperature where you left off. This spray setting helps you conserve water, so you can worry less about depleting your supply of hot water - and you help the environment too. 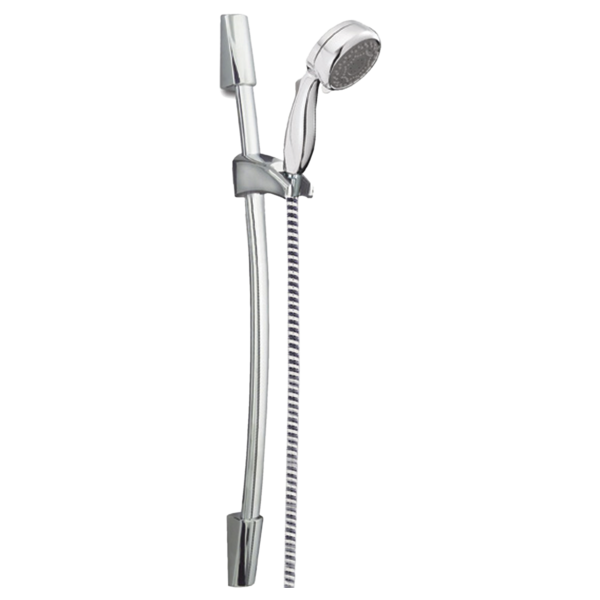 Rated 5 out of 5 by Ricky P from As Expected The Delta Hand Shower package was as expected. Great design, quality in materials and finishes. It came with very clear and easy to follow instructions for installation. I’m very please with the overall quality and function of this product. Would like to incorporate this wall bar with a separate rain head. How would I install to stop the flow of water from the hand held and divert it to the rain head? Should the shower head button be installed up or down? We purchased this shower and wanted to know which way the shower bar should be installed. There is a button on the shower head handle to move the shower head up and down on the bar. Should be the button be on the top or bottom of the handle? If it is installed with the button on the top, would there be issues with the angle of the shower spray and/or water/dust getting into the button mechanism?